Dorothy Lamour, Jon Hall, Lynne Overman et al. 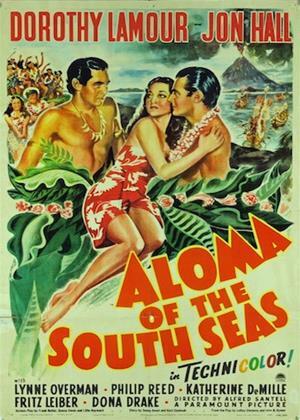 The South Seas romance is set on the scenic island of Tahiti where the island chief betroths his son to a woman and then ships him to the US to attend Harvard. During the return voyage the lad is befriended by the ship's captain who also protects the beautiful girl the boy meets, but doesn't know he is supposed to marry. The two end up falling in love, even though the young man has sworn not to marry the girl his father picked out for him 15 years before. Meanwhile another jealous girl interferes with the romance as does another chieftain who wants the betrothed girl for himself and so tries to kill the young man. The whole mess is later resolved by a tremendous volcanic eruption which destroys the island and leaves the girl standing alone on a rocky peak staring at the blood red sun slowly sinking beneath the horizon.